The event was organised on 6 March by the Global Health Centre at Geneva’s Graduate Institute, in cooperation with the Centre on Global Health Security at Chatham House, The Rockefeller Foundation and the United Nations Foundation. Each of the three remaining candidates: Tedros Adhanom Ghebreyesus (Ethiopia), Sania Nishtar (Pakistan) and David Nabarro (United Kingdom) have had to take time off their normal jobs to campaign in front of their peers and the public. The candidates all have the backing of their national governments. Prior to the event, there had been an open call for questions. The questions were grouped and made available to the moderators who chose them in discussion with the organisers and they were offered to the candidates in an equitable manner. There were no questions from the floor. The organisers said their interests are focussed on political leadership and diplomacy and they would like to see how the candidates approach issues of power, competing interests of stakeholders, processes of consensus-building, representation and the like. Each candidate began with a three-minute outline of their political leadership vision for running the world health body. In many instances, each of the three supported the same points and it is clear that for three exceptionally qualified candidates the choice may largely come down to management style. The moderators were Andrew Jack, head of curated content at the Financial Times, and Diah Saminarsih, special adviser to Indonesia’s Minister of Health. Dr. Sania Nishtar is a qualified medical doctor with experience in civil society serving on the boards of the likes of Gavi and the Chal Foundation, along with public sector experience, having served as a federal minister in Pakistan. She gave the most detailed responses, but sometimes ran over time in her answers. She began by saying, “The global political landscape has changed and so has our understanding of health…. WHO must readapt and reconfigure. WHO has a clear rear mandate to lead on some complex transnational threats.” Among examples she cited were different types of infections, antimicrobial diseases and non-communicable diseases. She also said WHO must exercise “effective public health diplomacy.” Up till now, said Nishtar, WHO has engaged with ministries of health. “But in the new era of [United Nations] Sustainable Development Goals, we know that many sectors other than health deeply impact health standard decisions,” while noting that decisions such as universal health coverage are not taken by ministers of health but by heads of state. She noted a modern paradox of increased expectations from WHO but also the prevalence of financial uncertainty, so the next director general will need to be able to communicate an effective investment case to get the necessary financial support. WHO has a fine-balancing act in its role seeking to effect policy and must “stand by evidence-based positions” even if these have political implications in order for the secretariat to be effective. Nishtar asserted that the director general has a very important political role to play internally within the organisation, in order to break silos, bring reforms to fruition and overcome blockages within the membership when they occur. “WHO has to very careful to firewall its normative work from the many non-state actors which have to be and must be engaged in order to work on the Sustainable Development Goals,” said the Pakistani candidate who ended by saying she believes she has the experience for the job. Each candidate answered the same question moderated by Jack and Saminarsih, and hundreds of twitter questions were received. Dr. Tedros Adhanom Ghebreyesus (“Tedros”) is Ethiopia’s minster of foreign affairs, has a PhD in community health and a master’s in immunology of infectious diseases, having also worked as a co-chair of the Roll Back Malaria campaign. He tends to speak more in headlines with points pushing his case anecdotally on his successes in reform while he was Ethiopia’s health minister from 2005 to 2012. He sees national health organisations at country level as key. He noted people have been advocating health for all since 1947, so it is a given that they continue to do so. “My first priority is universal health coverage and the second is emergency preparedness. The third focus is on women and children and adolescents; fourth climate change and environmental change; and the fifth is we need to transform the WHO to achieve the four priorities. “I believe all roads should lead to universal health coverage, breaking the financial barriers, breaking access to quality and services and breaking the barrier to medicine., he said. Universal health care should then be used to address communicable and non-communicable diseases. “On emergency preparedness, the world is waking up now and we need to be moving” with a sense of urgency. 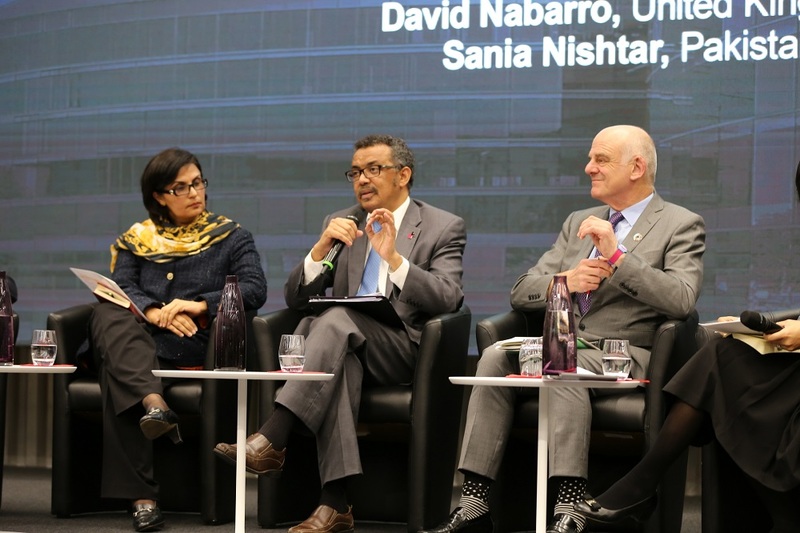 “We are sure there will be an attack by pandemics…We must prepare,” said Tedros. Marginalising woman and children is dangerous, and regarding climate change it is a matter of whether “we are in or out on this” and have to make WHO more effective in doing the right things with effective independent assessment. Dr. David Nabarro is the insider of the candidates and is Special Adviser to the United Nations Secretary-General on the 2030 Agenda for Sustainable Development and Climate Change. A trained medical doctor, he has often been likened to a troubleshooter for the WHO, for example during the West African Ebola crisis that started in 2014. “Politics is about looking at the way in which power influences people and it is about using power to change their situation,” he said. “The good use of politics is using power to make sure people are healthier. “We must always be skilled at engaging with politician of all kinds to ensure that in the process they use their power for the political good,” said Nabarro who joked with Tedros a number of times. Nabarro said it is known that people without power or limited power are less able to ensure their health and to access health care as well as say accessing clean water and food. “We know that health workers who lack power are unable to defend the interests and rights of the people who they seek to benefit,” he said. Nabarro noted, “We know that UN organisations are used to ensure that power is used for the common good and that is what the Sustainable Development Goals are all about.” The same applies for the primary health care movement. The WHO is right at the centre of this health movement and is at the centre of sustainable development, Nabarro asserted. “The director general of the WHO has a unique role, because although the organisation is bounded by its member states and they exercise political control over what it does, the director general is empowered by the member states to act for the best interests of people,” he said. “The role of the member states on May 25,” Nabarro continued, “is to identify the director general whose track record and value system shows that she or he is able to harness political power for the good of everyone” at every level, in regions, sub-regions and everywhere. "WHO Director General Candidates Showcase Campaigns To The World" by Intellectual Property Watch is licensed under a Creative Commons Attribution-NonCommercial-ShareAlike 4.0 International License. I am an Ethiopian and I oppose the candidacy of tedros. He was foreign affairs minister of a genocide criminal and dictator junta. He is the least qualified fake doctor and responsible for Malaria, Cholera and HIV epidemic during his tenure as minister of health. There are many qualifying African scholars to lead WHO and it is unbelievable that African dictators endorsed this criminal. I am glad to see that Douste dropped out. **** On February 5, 2005, Douste-Blazy, Minister of Health, ordered the destruction of the rapport published in 2004 by the INSERM (National Institute of Sciences and Medical Research) that concluded to the superiority of the cognitive behavior therapy over the pseudo-scientific Freudian concepts used by French psychiatrists. This censorship, stated in public by a Minister of Heath, was deemed a ‘French psychoflap” by Science (volume 307, page 1197). **** He announced himself on television at prime time the advent of the anti- hepatitis B vaccine. The vaccine was over-loaded with harmful aluminum and induced multiple sclerosis, both observed in 1998. The producer was sued. Douste organized a meeting of experts to refute the accusation of iatrogenicity of the Hepatitis B vaccine. He excluded all results not obtained in France, restricted the analysis to multiple sclerosis despite proof given in a thesis that the vaccine induced other ailments and rejected the proofs put forward by a French investigator, Dr Groussac, who convincingly presented at that meeting evidence of important occurrences of vaccine malfeasance. After this whitewashing of the vaccine, Philippe Douste, minister of Health, Jean Dehecq, CEO of the Sanofi/Pasteur that produced the vaccine, and Jacques Chirac, President of France, met on Friday November 2004 to decide the pursuit of the vaccinations. Both the content in aluminum and in vaccine material were subsequently lowered, which allowed a rejection of all the charges in 2016. I suppose that the experts were as good as those who cleared the BCG used in the Chingleput trial and those who banned the TB-serology. **** Also on television, the Minister of Health Douste-Blazy announced that one (one, i.e. 1) supposedly rabies-infected dog had been imported from Morocco. Notwithstanding the fact that cats are not susceptible to rabies, he proposed that all cats and dogs of the Republic be vaccinated each year with a rabies vaccine at the expense of the owners of these animals and for their own good, at the cost of 750 million euros. He was wise enough not to include canaries and goldfishes in the elected species. Neither the dog nor the five persons supposedly bitten by it were ever found. Only 15% of people bitten by a rabid animal (essentially foxes) catch the disease. Could this obscene proposal by Douste to vaccinate all cats and dogs each year against rabies and the pursuit by Douste, Dehecq and Chirac of the hepatitis B vaccinations of infants, and the current insistence of the French State to promote vaccinations against influenza and TB derive from the need for Sanofi/Pasteur to pay on April 25 2004 the purchase of Aventis at the extravagant sum of 55 billion euros? ***** Douste visited the Prime Minister Ph. de Villepin to claim his reward for these corruptions. He vehemently requested a quid pro quo benefit in exchange of his felony and obtained it. He shouted, yelled and threatened (as confided to me by a diplomat stationed in Strasbourg) and obtained his nomination as Minister of Foreign Affairs. To this end, Villepin ousted the very competent Barnier from his seat. The French diplomatic corps is a superb organization. The buttocks of Douste in the seat once occupied by Talleyrand and Chateaubriand was an insult and a vivid proof of the degeneracy of the Republic the diplomats serve. His nomination generated a revolt of the diplomatic corps so intense that it was displayed at prime time on TV when Douste pretended to meddle at New York in the foreign affairs of the world. He had to go, and fast. Chirac organized his escape with the extortion of a $1.0 tax from all departing passengers from French airports and the offering of this bounty to the UN, in exchange for a place of Douste as Vice-Secretary. Ban – Ki- Moon accepted the deal and Douste is now Board Chair of Unitaid and contender for the position of Executive Secretary of the WHO. **** Douste does not care who he has to step on to get what he covets. To this end, he hesitated not to compromise the health of hundreds of thousands of infants of his own people. He puts careerism way ahead of scientific honesty.